It was an incredibly peripatetic and mind-opening summer that took me from the TCG National Conference in Chicago to the Aspen Ideas Festival on top of Aspen Mountain to The Cape Cod Theatre Project in Falmouth, Massachusetts, and finally to the Getty Villa in Malibu, where I directed a major production of Sophocles’ Elektra. 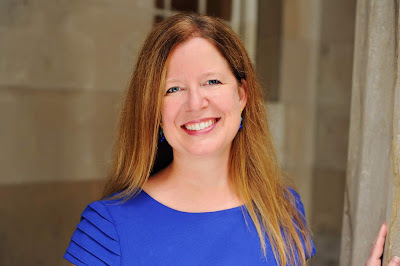 At the same time, we were preparing for the arrival of our new executive director, Ellen Richard, at A.C.T. and continuing discussions about the future of our facilities. Needless to say, a whole host of ideas swirled around my mind all summer. At the heart of the TCG Conference was talk about transparency and participation: how can we create a theater environment in which more people feel engaged with the actual creation of the work and understand that it is happening locally, organically, in their own communities? Having just come off the incredible experience of creating The Tosca Project here at A.C.T., it was clear to me what happens in a community when a piece of work is made that grows directly out of the mythology of a particular place and time . . . which was an interesting starting point for me in trying to envision, or return to, a model of nonprofit theater that is really grounded in a core of artists in a particular place, rather than in the Broadway tryout mentality that has infected so much of the American regional theater. When I got to the Aspen Ideas Festival (a collection of the most mind-blowing people, in the most beautiful place on the planet), we all gathered in a big tent the first night to listen to 20 people in three-minute bursts deliver some “big ideas.” A few really popped for me: the extraordinary Somali feminist Ayaan Hirsi Ali made an impassioned cry for western democracies to take bigger responsibility for delivering a message of female education and individual rights to Islamic youth at risk of being co-opted by the jihad. NPR CEO Vivian Schiller spoke of her excitement about the rise of “public media” and alternative sources of financial support for journalism (since the marketplace can’t pay for it, even though the culture needs it). Almost everyone spoke of creating institutions and behaviors that are somehow “sustainable” in a choking world. Playwright John Guare and I met at 9 a.m. the next morning to answer the question, “Is there a future for the live theater in America?” in front of 250 people. 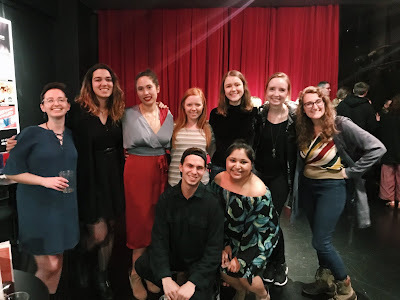 We could have just said “no” and called it a day, but I attempted to put all of these ideas together and paint a picture of a sustainable and vigorous theater. This kind of theater would be embedded in a particular community and take responsibility not only for keeping great works of literature alive but also for training the next generation of actors to perform them, and for educating new audiences to experience them. Rocco Landesman from the NEA was in the front row; he’s been promoting the creation of art zones in blighted American neighborhoods, so we all riffed on the Tenderloin in SF and on how the creation of transparent arts spaces in the center of that kind of neighborhood could be a catalyst for a much bigger urban conversation. It was fabulous to see so many Bay Area friends and philanthropists in the audience: Lisa Pritzker, Randy Fisher, our own Jeff Ubben, Janet McKinley, etc. I could go on and on about the remarkable scientists who spoke about breakthroughs in stem cell research, or the education track (led by NYC’s inimitable schools chancellor, Joel Klein) wrestling with literacy and falling standards, or our own Anna Deavere Smith [an A.C.T. M.F.A. Program alumna] wading into the ever-murkier waters of race in America, not to mention all your favorite New York Times columnists (Tom Friedman, David Brooks, etc.) giving pithier versions of a month’s worth of columns. Then there was hanging out chatting in the food lines (the fact that the air is thin in Aspen and the food was hugely abundant and incredibly good was real fuel for the headiness of the ideas) . . . Suffice it to say my mind was cracked open about ten times a day and I met people who rendered me absolutely speechless (and you know how rare that is). A week later I was with playwright Nilo Cruz in Falmouth, MA, working on his new play The Color of Desire. The Cape Cod Theatre Project is run by beloved Andy Polk (of Speed-the-Plow and November fame), and I loved watching him play “producer” for the summer. 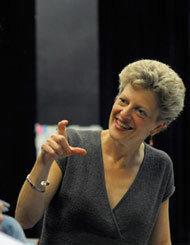 He was so nurturing of the playwrights and artists who came up to that gorgeous corner of the cape to develop new work. Nilo and I got our best ideas while floating on our backs atop the gentle swells of the very warm Atlantic Ocean, talking about Cuba after the revolution and other such things. Two weeks later I dove into the heart of vendetta-land with Elektra. We started rehearsals around Olympia Dukakis’s dining room table in Lower Manhattan with the incredibly fierce and fabulous Annie Purcell (Elektra) and Teresa Wong (cellist), carving out the choral odes of the play. Then we relocated to the Getty Villa in LA to dive in with the rest of the cast. What an incredibly rich, complex, heartbreaking, and timeless look at memory, family, revenge and love . . . and so wild to stage it in the Getty’s outdoor amphitheater surrounded by Roman gardens and statues, against the façade of the museum that houses one of the best antiquities collections in America. Every inch of the place helps fuel one’s imagination and becomes part of the play; it was hot and blue in the afternoons but by nightfall when we started staging things outside, the stars were shining and the breezes were coming off the ocean. It was mysterious and quiet and all we heard were the cries of Teresa’s cello and the sounds of human emotion against a vast landscape. A true invitation to think in a bigger way about one’s existence . 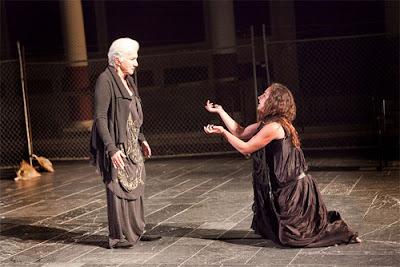 . .
Annie Purcell as Elektra (right) and Olympia Dukakis as the Chorus Leader. Photo courtesy of J. Paul Getty Museum.